The expansion of the Universe accelerates due to dark energy. There is alot of dark matter and dark energy in the Universe. We know by indirect observations that the dark matter should be there, but we can’t observe it directly. Also the dark energy is a form of energy that can be observed only from its indirect effects, but we have no knowledge of what it actually could be. 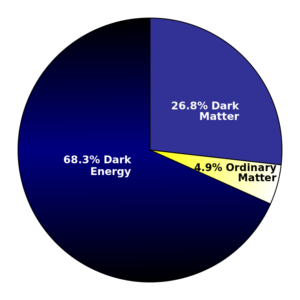 According to our current knowledge, the Universe consists of 73% dark energy, 23 % dark matter, and the rest, 4 %, is visible matter or energy. The expansion of the Universe has been slowing down untill now, but at this time it starts to be again accelerated by dark energy.